The Yangban (양반, 兩班 in Korean) were a well-educated scholarly class of male Confucian scholars who were part of the ruling elite in Korea prior to 1945 and during the Republics period of Korean history. The name yangban, literally "both classes," refers to the two classes it consists of: munban (문반;文班), the literary class, and muban (무반;武班), the martial class. The yangban were responsible for maintaining Confucian standards and elevating the morality of society. The yangban tradition of a close network based on education, teachers, family background, and city of origin, has been perpetuated within the Korean ruling class of the partitioned Koreas. In modern day Korea, the yangban no longer possess an advantage but many Koreans boast of having a yangban ancestor. Yangban ancestry can be traced through the Chokbo, the Korean equivalent of a family tree which is passed down in each family through the eldest son. Yangban connotes a high and dignified class status, even in the absence of wealth, comparable with the Sangnom class rather than with the educated middle and servant classes. Today, descendants of members of the yangban are still proud of their connection to the yangban class of the past. With the fall of the Goryeo (Koryo) Dynasty on the Korean peninsula, the Yi (Joseon) Dynasty arose, founded by General Yi Song-gye, who moved the capital to Hanyang (now Seoul) and began to establish an organized system of government. This political reformation was based on Zhu Xi (Chu Hi)’s philosophy of Neo-Confucianism. As Zhu Xi’s philosophy developed, the influence of Buddhism, which had guided the former Goryeo Dynasty, declined. It is important to understand how the Yi Dynasty came to adopt Zhu Xi’s philosophy. Zhu Xi was a Chinese philosopher of the Southern Song Dynasty. In 1125, the Jurchens ((女真Jīn Dynasty金朝), founded in 1115 in northern Manchuria), annihilated the Liao (遼) Dynasty, and defeated the (Northern) Song Dynasty in the “Jingkang Incident.” Emperors Huizong, Qinzong and the members of the Song imperial families were all captured and taken to the north. Emperor Qinzong’s brother, Zhao Gou, survived and took refuge with his followers in Lin’an (臨安; now 杭州), establishing the Southern Song Dynasty (1127-1279) and becoming Emperor Gaozong (高宗), the first emperor of Southern Song Dynasty. The Emperor of the Southern Song Dynasty had to be subservient to the Jurchens (女真, the Jīn Dynasty 金朝 ), and his rule was threatened by both external challenges and domestic difficulties. This situation was almost without precedent in Chinese history, and was considered a terrible disgrace to the Chinese people. Zhu Xi, who was born during the Southern Song Dynasty, developed a philosophy which grew out of the political awareness that China was constantly on the verge of a crisis. It was appropriate that the Yi Dynasty in Korea selected Xhu Xi’s philosophy as a means of overcoming their own political crises. The ideology of Confucianism, especially that of Zhu Xi, could be applied to secular matters, unlike Buddhism, which required isolation and monasticism. Because the Korean peninsula was always in crisis, Koreans adopted Zhu Xi’s philosophy and enhanced it with a strong belief in “li,” supreme natural law, and the confidence that as long as they followed its precepts, "li" would protect their nation. Zhu Xi’s philosophy promoted a system of “imperial examinations” or “national civil service examinations” (科挙, gwageo or kwago in Korean). The system of civil service examinations began in China during the Sui Dynasty, and in the Korean peninsula in 958, during the Goryeo (Koryo) Dynasty. It appears that during the Goryeo and Yi Dynasties, the civil service examinations in Korea were open only to members of the aristocratic Yangban class. In principle, anyone who took the exam and passed, regardless of their social and economic status, could obtain a position in the government. This social atmosphere, in which anyone’s personal ambitions could be realized, exemplified Zhu Xi’s philosophy. The civil service examinations were held under two categories: munkwa (civilian) and mukwa (military). Munka was considered more important than mukwa. During the Yi Dynasty (1392-1910), 15,547 persons between the ages of fourteen and eighty-two were able to pass the munka exam, and some of these became government Ministers during their twenties. One could become a yangban by taking these exams, the results of which determined placement in high-ranking civil positions. In practice, however, often only the wealthy and the well-connected had the means to support themselves while they studied for the exams. In the late Yi Dynasty, exams were rigged to favor those from wealthy families and the sons of yangban. The yangban dominated the Royal Court and the military of pre-Modern Korea and were often exempt from various laws, including those relating to taxes. Yangban (両班) literally means "both classes," referring to the two classes of which it consists: munban (문반; 文班), the literary class, and muban (무반; 武班), the martial class. (Scholars who were preparing for the national exam (Kwageo), were also considered to be part of the yangban.) These two groups were considered the scholars of the ruling elite class; however there were several other types of educated scholars in Korea. According to a book written at the end of the eighteenth century about the yangban by a scholar named Pak, “yangban” was a general term and a title of honor. Many of the most famous Sonbi were public officials who passed a rigorous government exam, served in office and retired as early as possible so they could be alone with their ideas. They built homes on mountainsides... Tosan Sodang was the home of Toegye Lee (Yi) Hwang after his retirement as mayor of Tanyang City. Togye, whose portrait and home is on South Korea’s one thousand won bill, was a brilliant student. He passed the royal exam with flying colors and proceeded along an ambitious career path, often acting as adviser to the royal court. However, he was not satisfied and longed for a peaceful life. After several years of preparation, he returned to his native Kyongsang home in Andong. (The Korea Times, David Buwalda). Zhu Xi’s philosophy, originally imported from China, and developed during the Yi Dynasty, reached its climax in Taegye Yi Hwang, who transformed Zhu Xi’s concept of “li” into a lively philosophical movement. Taegye’s ideas, that man should partake of both knowledge and its practice, became established in Korea. His theory influenced Japanese scholars and the basic educational principles of Japan in the Meiji era. A representative of the sadaebu was Yi I (1536-1584), whose pen name was Yulgok. At the age of 13 he became a “chinsa,” one who passed the civil service exam in the literary department. He went on to pass the gwageo (or kwago) nine times, achieving the highest score each time. At a young age, he had already started his government service, joining an elite class in the government which formed the nucleus of politics and promoted the establishment of an ideal Confucian society. He had far-sighted vision and insisted that his country should immediately train 100,000 soldiers to counter possible attacks from Japan. His suggestion was rejected by the central government, especially by Yu Song-yong, who held the opinion that training soldiers would result in disaster, and that Korea would be sufficiently protected by its adherence to Confucian principles. When Toyotomi Hideyoshi’s Japanese forces invaded Korea in 1592, eight years after Yi I’s death, Yu Song-yong regretted his decision and praised Yi I as a true sage in front of his administration at the royal court. Today, Yi I Yulgok is depicted on the South Korean 5,000-won note. Many religious ethical systems are enforced in a spiritual realm, set apart from the realities of the everyday world. Confucian ethics and morality apply directly to the secular world. Virtue, power and fortune are regarded as an inseparable trinity, and a combination of these three was considered the ideal state of the yangban. There is an inherent conflict, however, between the possession of virtue and the possession of wealth. Eventually a movement to regain virtue developed and expanded among the Confucian elite. For example, Yangban landlords who rendered distinguished services to King Sejo of Joseon around 1455 fought against a group of sadaebu. However, when King Seonjo ruled Korea between 1567 and 1608 , he included many sadaebu in his government. The yangban system was relatively free of corruption during the earlier part of the Dynasty. After the Seven-Year War, however, the system collapsed along with the economy. In addition to stipend granted to them from civil service duties, the yangban often received bribes and other illegal forms of payment in exchange for positions in the Royal Courts and the Military. Often, corrupt yangban also confiscated land from the peasants by imposing ridiculously large taxes on the land and then seizing the land when they could not pay. The Yi Dynasty had a strict hierarchical class system composed generally of four classes: Yangban, chungin (intermediate class), sangmin (ordinary people) and ch’onmin (lowest people). “Chunhyangga,” a popular traditional Korean legend which embodies Confucian ideals, tells the story of the love between Chunhyang, a woman of the lowest class whose mother was from the family of an officer (gisaeng), and Mongryong, the son of a yangban who was a governor in the region. They married secretly, but Mongryong, being the son of a governor, was obliged to go Seoul when his father was transferred there, and to study to become a governmental officer. He promised to Chunhyang that he would come back to her. A new governor in the region was attracted to Chunhyang, but she rejected him because of her love for Mongryoung. Chunhyang was imprisoned and tortured. In Seoul, Mongryoung passed the national civil service examinations and was appointed a high-ranking officer and an undercover royal inspector. Hearing of Chunhyang’s plight, Mongryoung came back disguised as a mendicant. Just one day before Chunhyang’s execution, Mongryoung appeared as a mendicant at the birthday party of the new governor, and in his capacity as an official undercover inspector, exposed his wrongdoings. He then married Chunhyang in spite of the difference in their social status. The yangban were expected to hold public office, follow the Confucian tradition of study and self-cultivation, and help elevate the moral standards of Chosôn society. They enjoyed many privileges as an elite class, and sought to preserve their status and exclusivity; for example, by marrying only other members of the yangban class. Within the yangban there were also numerous hierarchical distinctions which were strictly observed. Toward the end of the Chosôn dynasty, yangban society began to disintegrate because of the grievances and complaints of large numbers of discontented or "fallen" yangban, especially those residing outside of the capital city of Hanyang (present-day Seoul). A defining characteristic of the Chosôn yangban was their knowledge of the Confucian classics and Neo-Confucian thought. Numerous writings by members of the yangban class, in classical Chinese, provide details about the ancient and contemporary texts they studied, the discussions which they carried on among themselves, their new ideas and the ways in which they developed government policies. In addition to the written documents themselves, some of the objects most associated with the cultural life of the yangban are writing instruments, such as beautiful porcelain or wooden brush holders and porcelain water droppers, inkstones, brushes and paper. These were displayed, along with refined wooden furniture, in the sarangbang, which functioned as both a study and receiving room and was the most important room in the male quarters of the typical elite Confucian house, which was divided into male and female areas. The yangban considered themselves custodians of proper Confucian morality, and practiced rigorous observance of Confucian rites, particularly cappings, weddings, funerals, and ancestor worship. Depending on social class and whether the rites were private or official, different degrees of ceremony were observed. Objects such as ancestor portraits or porcelain ritual vessels which were used by the court or yangban in these rites are valued today both for their artistic beauty and for the principles they represent. Many yangban were accomplished artists, practicing calligraphy and ink painting, the disciplines which were traditionally considered most appropriate for Confucian scholars. Especially popular were ink monochrome paintings of bamboo, orchid, plum blossom, and chrysanthemum, which were originally associated with the four seasons and came to represent the Confucian scholar. In the latter half of the Chosôn dynasty, new and innovative modes of painting developed, including the "true-view" (chin'gyông) landscape and works incorporating Western techniques. 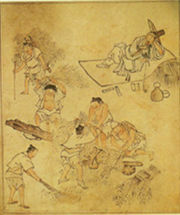 The leisure activities of the yangban were prominently captured in genre painting, which flourished during the eighteenth century. This page was last modified on 30 July 2013, at 21:07.